‘Firenado’ footage captured by firefighters during UK factory blaze. Firefighters have captured the fascinating and mesmerising moment a “firenado” engulfed a plastics factory in Derbyshire – which reached an astonishing height of more than 50ft. 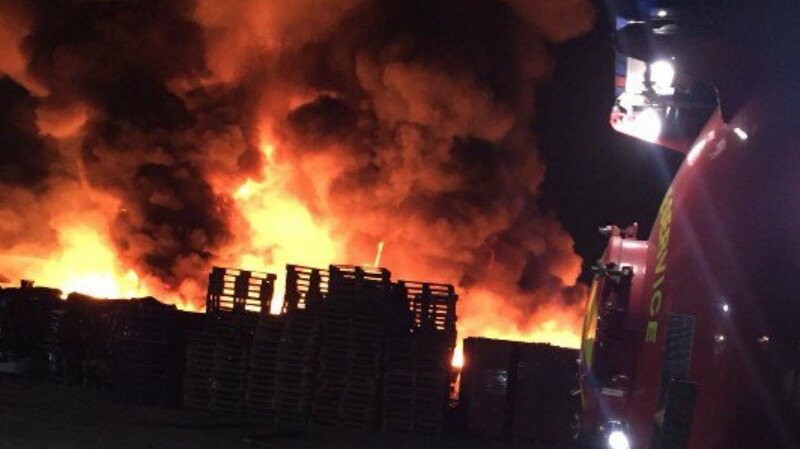 Firefighters had been tackling the blaze since about 1.20am on Tuesday at Ravensbourn Plastics Ltd on Occupation Lane, in Swadlincote. The fire whirl had also spread to a small site building and a number of fork lift trucks at the property, Derbyshire Fire and Rescue Service said. Firefighters from Leicestershire and Staffordshire also joined to help prevent the large fire from spreading. At around 3pm firefighters began damping down the fire, which involved stacked plastic pallets – ordinarily used for making plastic crates for supermarkets. Leicestershire Fire and Rescue Service, who helped tackle the blaze, shared the video on Facebook, saying: “Whilst we were firefighting at Occupational Lane we witnessed a firenado or a fire whirl . No injuries were reported but a huge black smoke cloud seen as far as 15 to 25 miles away including Shepshed in Leicestershire and Nottingham City Centre. Speaking while crews tackled the fire, the Derbyshire service’s group manager Steve Wells said: “We’ve received lots of calls to our control room this morning, as people in the Swadlincote area have woken to the sight of a large black smoke plume. Wells added: “Crews from across Derbyshire, Leicestershire and Staffordshire have been working hard since the early hours of the morning, jointly with partners from the police, Seven Trent Water and the Environment Agency, to bring the fire under control, prevent any further spread and bring the incident to a safe and swift conclusion.